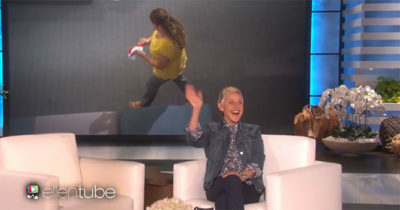 To celebrate the 14th season premiere of her daytime talk show, Ellen DeGeneres offered members of her studio audience free stuff before a recent taping. The production crew put up a sign instructing the audience to take one, and only one, item per person and also set up a hidden camera. And when the the studio cameras rolled, DeGeneres gave kudos to one woman — former child actress Vanessa Lee Chester — for doing exactly as instructed, taking only one item and opting to purchase a second one later. In fact, DeGeneres even gave that second item, a hat, to Chester for free, to honor her honest choice. However, a woman named Nancy made what can only be described by parents everywhere as “a bad choice.” All of it was caught on video and shown for all to see. Nancy confessed she was taking more for her sister who could not attend the taping. Then DeGeneres punished her before the entire television studio.